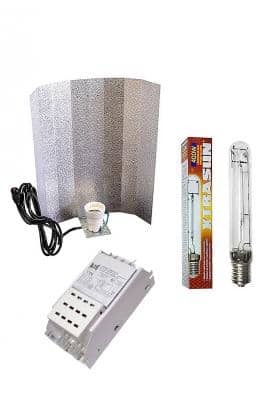 This Cultivation Kit for the growth and flowering phases carries the following materials: a Plug & Play ballast, a reflective mirror or stucco, a wire, a plug cable and a Sylvania growing lamp. 400W or 600W of power. - Safety Plug & Play (Ballast) ambivalent 400W or 600W. - Reflective mirror or stucco. - Sylvania Grolux Sodium Lamp. This cultivation kit for the growth and flowering period are delivered as installed as possible. However and considering that these grow kits sometimes have distinct configurations you will need to make some type of connection when you receive it, but always in a simple way of doing it. When choosing the type of reflective, mirror or stucco, please refer your choice in the comment part of your order. In case you do not state anything we will send the first coming at our hands. Rest assured, the efficacy of both is the same. The two different powers available from this kit you can cultivate in a higher or shorter areas. Some growers use more power than others for the same growing area as long as there is a minimum of 400W per square meter.